It’s a very unfamiliar thing to be here writing a blog post. These days, between facebook updates and an occasional tweet, I don’t feel the need to write many blogs to express myself or update people on what I’ve been up to. But occasionally, I have something to say that I believe google needs to find, and given that my facebook posts rarely never go viral, this is the best place to express those thoughts. A few weeks ago Meg and I realised that given the girls were down South for the school holidays, we could go away and undertake a cyclng trip that might be too long for their little legs. 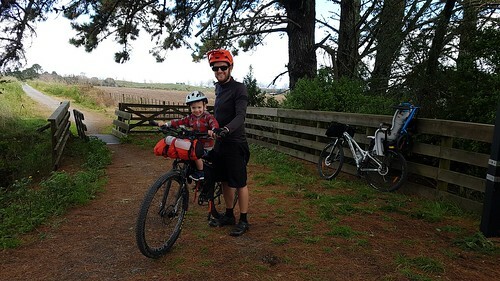 One of the trails that had been on our list to try out was the Twin Coast Trail, between Opua (near Paihia) on the East Coast of New Zealand’s North Island, and Horeke on the West Coast (Hokianga Harbour). It’s 87km, and depending on which guides you read, is either grade 1 and 2 (I share this opinion) or grade 2 and 3. A little bit of background on my and my cycling. 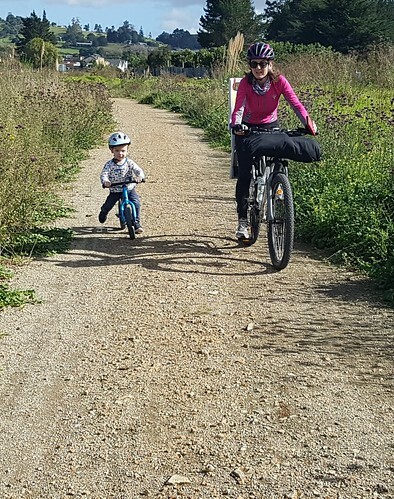 Up until a couple of months ago I was a very casual cyclist who mostly rode my 10km commute to work and spent holidays doing short bits of New Zealand’s cycle trails with my family. However in February I did the Tour Aotearoa, riding 3000km from Cape Reinga right at the top of New Zealand to Bluff right at the bottom. 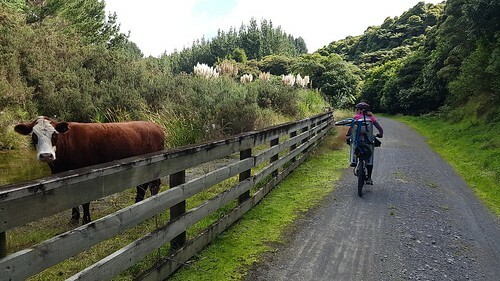 As part of this I rode many of NZ’s higher grade trails as well as the full length of trails such as the Timber Trail and West Coast wilderness trail. 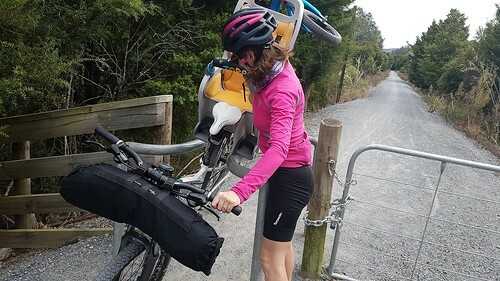 After all this, I would rate the Twin Coast Trail the second best two day ride I’ve done (after the first two days of the West Coast Wilderness trail, Greymouth to Hokitika). Note: On the TA I did this and a bit extra in 1 day. 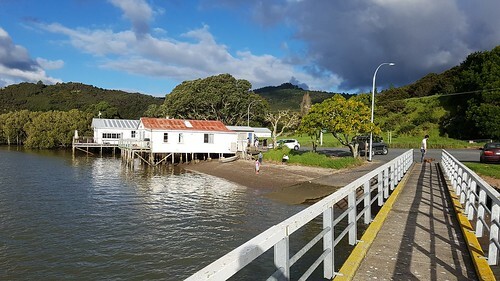 Originally I had been planning to driving to Opua, park up and ride (with gear) to Kaikohe (well equipped settlement, halfway along the trail). Then ride the second half to Horeke and pay to be transported back to Opua. However after starting to ring around I struck the super helpful Lindal at All Seasons Bike Hire. He explained that people normally based themselves in Kaikohe and rode downwards in both directions. After explaining my situation in terms of timing (and the fact I didn’t want pay for full transfers at both ends) he offered to think about it and call be back. Five minutes later he called me back with a fantastic solution, at a price that was far cheaper than what anyone else was quoting. He also proved to be prompt, friendly and well informed. I can’t recommend him and his company more highly. So, on Saturday we drove up from Auckland. It was a 3.5 hour drive and in all honesty, the seven hours of driving in a weekend felt like a little too much and in future we’ll spend a few more days up there. We got to Kaikohe at about 11am and were fortunate to be able to get into our motel room and leave some gear there. By the time we left we were already well later than Lindal’s recommended time, but we compounded the error by following an eroneous map I had downloaded to my garmin. I won’t link to it because that just makes things worse, but take my word, DON’T USE THE MAP YOU FIND ON MAPMYRIDE FOR TWIN COAST TRAIL. If I get time I’ll make a proper route file. So after leading Megan on a 6km detour up a crazy gravel hill road and down again, we found the start of the route. 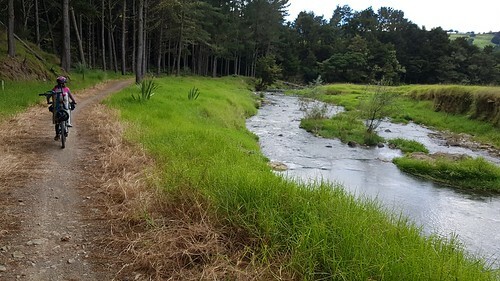 Lots of sites can exlain in detail the route, but suffice it to say that it was varied, almost entirely off road and had a particularly lovely 10-15km stretch which they consider to be grade 3 but is in fact just lovely, river-side flowing gravel (my highlight of the trail). I’m a particular fan of the Hokianga harbour (apparently they may extend the route through to Rawene which is a fabulous idea) and the boardwalk at the end was a beautiful and straight-forward way to finish the day. Lindal picked us up at about 4:30pm, impressed by the speed we’d knocked that off. I didn’t understand why until upon reflection I eventually worked out that I’d forced Megan to ride the 43km almost without breaks. One particular frustration was the frequency and design of the cattle stops. They’re the standard ones found around NZ, but were an absoloute pain for Meg’s bike with the baby seat on. If you have the option, avoid bringing a childseat. I had Leon on the DoLittle bike seat for most of the trip which didn’t have a problem with the cattle stops and he had a lot of fun (and the occasional cuddle). We enjoyed dinner at the RSA in Kaikohe and got an early night (I think Meg was asleep before Leon). A quick note on the Mid North Motor Inn where we stayed. It was well equipped, well priced and we will stay there again. I loved the rooms, because it felt like we had been transported back to the 70’s. But I am aware that one person’s “retro” is another person’s “dated”. We also really appreciated their secure indoor storage of the bikes and related gear. The next day started with me driving the car from Kaikohe to Opua. Lindal then picked me up and brought me back to Kaikohe (part of his ingenious plan) and we went down to start the day (as I always tried to do on the TA) with breakfast at McDonalds. After this we hit the trail and quickly got into a good flow through the fantastic scenery. A highlight for me was coming across an unfortunate family whose son had been stung by an insect (bee, hornet etc). When I did the TA I had been well prepared but fortunate to not have too many health problems. But I think it was safe to say I was the most prepared cyclist on the trail that day. His Mum asked me if I had any cream to put on the bite, and after supplying honey-based balm, I added antihistamine and paracetamol to the list of my contributions and kept riding. 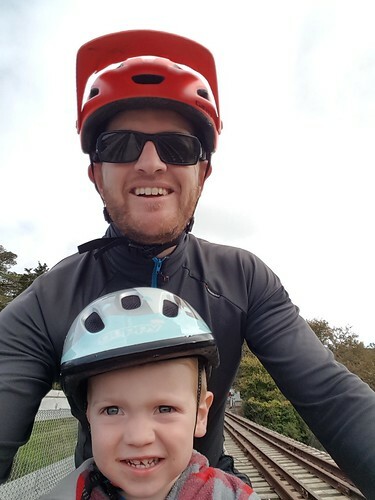 We enjoyed a nice lunch in Kawakawa (while trying to convince Leon that we would return to go on the train with his sisters) and then rode the last section down to Opua, got to the car and drove home. It’s worth noting that the last section may change quite dramatically in future years. 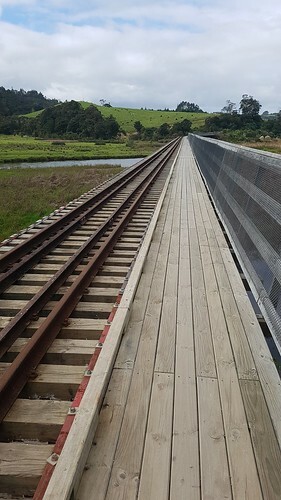 At the moment you get to the old train station after Kawakawa and ride across an awesome wooden rail bridge (apparently the longest curved rail bridge in the Southern Hemishphere) and then ride the rail trail in to Opua. Apparently the vintage railway want their land back so that they can run their trains into Opua. This may mean that cyclists are “forced” to catch the train for this leg, which would be a great experience but something different. This leg is stunning as it is, so I’d recomend getting up there soon and riding it. Megan and I had a great weekend a few days ago. I wanted to capture the experience in a more permanent way than a Facebook status, and given we ditched our kids and left Auckland for the first time in 6 years, why not dig out this blog for a post! We left Auckland at 3:30 (I took a half day and picked up my new bicycle, but that’s another story) and promptly got stuck in traffic for 3 hours. We gave up in Manukau at 6:30 and went and grabbed dinner. Eventually, we made it to our accommodation at National Park at about 10:30pm. The plan was to do the Tongariro Crossing the next day, but the weather was looking bad. We got up anyway the next day at about 6am, had breakfast and were ready to go, only to be told the weather made it unsafe. Off to plan B. We decided to head off to Lake Rotopounamu for a 2 hour walk and lunch. It was quite beautiful, and like every time I get into the bush, I was gushing about the majestic and beautiful trees. We then headed into Tauranga and had a very competitive game of mini-golf (Pete won) and had a soak at the Tokaanu Hot Pools. We finished the day with dinner at a lovely restaurant at the train station in National Park where Megan and I had eaten about 8 years ago. In the end we had an early night, hoping that the weather would let us do the crossing the next day. Some of those who would have done the crossing on the Saturday were clearly not going to try the next day, most notably the drunk middle-aged group of women who had been discussing what to do with an engagement ring after divorce over breakfast that morning. The next day dawned marginally better than Saturday, with the forecast predicting 70kph winds at the red crater instead of 95kph the day prior with minimal rainfall. They gave us the ‘go ahead’ but delayed us an hour or so to let the winds die and the temperature increase. Eventually we bussed to the start of the crossing and started ascending, surrounded by cloud. We got a quick ahead of the ‘crowds’ and got along well. In some ways the cloud probably helped us as we were not overawed at all by the task ahead of us (given we couldn’t see anything). We climbed higher and it got colder and windier. Fortunately at this stage, the wind was at our backs, so it certainly helped us. The photo below is probably a significant way up, but certainly not near the top (as we’re still smiling and not looking overly cold). For the record, we’re wearing our full ‘mountain’ gear with thermals top and bottom, polar fleeces, gloves, hats, scarves etc. As we walked up we passed the turn-off the summits of the mountains, but considering the weather, it didn’t make any sense to make those attempts, but something for another trip. The higher we went, the colder and windier it got, but we were not prepared for what hit us as we got to the ‘ridge’. The ridge was about 4-5m wide (we couldn’t see anything down either side because of the cloud so were imagining huge drop-offs) and the wind was unbelievably strong, blowing from one side to the other (another walker suggested the wind was about 100kph. We were actually afraid we were literally going to be ‘blown off the mountain’. As we first got to the top Megan grabbed me and I told her I had to keep going because of how ‘vulnerable’ I felt while standing still in the wind. We climbed mostly in silence for the next half an hour or so as we struggled up the ridge. As we got to the penultimate point of the climb (before we headed back down to the lakes) the wind was at it’s strongest and I felt I couldn’t even stand up. I ended up essentially crawling the last couple of metres, a strategy the guy behind me also followed when I chatted to him a bit later. But it was all worth it when we got over the top and the cloud cleared a bit, giving us something to look at finally! We had an extensive and delicious lunch by this beautiful lake a couple of minutes walk off the main track. The only thing missing was a thermos of coffee (there’s always next time). Then we began the long walk over the plateau and back down the mountain. By the time we got to the bottom we were pretty sore, a feeling that was to become familiar over the coming days. Our bus arrived a little early and since everyone had arrived, we were able to head off about 45 minutes ahead of schedule, a fact all of us with a long drive home (most of us) were very appreciative of. After a five hour drive home, most of which was done by Megan because of my painful back (the only time it really inconvenienced me) we got home, picked up the girls and concluded a full, but fun and successful weekend. Colton Dixon’s debut album, ‘Messenger’ won’t be everyone’s ‘cup of tea’ (it’s pretty “upbeat” (read: rocky)) but you have to love the depth of the lyrics of his songs. I really hope this is having a major impact on the millions of people around the world who saw him on American idol. So what’s left to do but surrender? The way you never let the past enslave me How do you do it? So, what’s left to do but surrender? I’ve been on a bit of financial planning binge over the last several months. This was prompted by a bunch of books I’ve been reading including the books from the ‘Rich Dad, Poor Dad‘ series and a bunch of investment books (including shares, bonds and property). Meanwhile there has been a house price spike in Auckland, New Zealand as can be seen from the tail end of the graph below (data from Barfoot & Thompson). Interestingly, during this period, total returns are 21% or 4.2% per annum. Adjust that for inflation and you got a 1.8% return on your investment, hardly amazing. But that’s a subject for another post. Back in 2005 when we bought our current house (a 3 bedroom house on a small section on Auckland’s North Shore) we were able to get it with a mortgage of about 3.5 times our combined income. We then went overseas for a couple of years and came back ready to have our first child. Fortunately, my income had increased, so we could still afford our mortgage (3.7 times income). These days, with two growing pre-schoolers, a wife who’s just finished studying and is returning to work our mortgage is a very healthy 2.3 times income. Here’s the issue, like many of our peers (and generations before us) we’re now growing out of our 3 bedroom house on a cross leased section. In previous generations they may have just added an extension (not possible with so little land) or simply moved to another house with only a marginal increase in their mortgage. Even though our house price has to some extent kept up with house price increases, acquiring a four bedroom house on a full section in our neighbourhood would require us to increase our mortgage by 82%. This would mean our mortgage was now 4.3 times earnings, without the likelihood of the dramatic salary increases possible in the earlier years of your career. [Note, this site suggests 2 – 2.5 times gross earnings]. This is actually the house we’ve most liked in our area. Well above the 4.3 ratio though! There’s a lot written about housing affordability and the fact that people can’t afford a first home. I’m looking on one step further, even if you can afford a small first home, based on two incomes, what future can you look forward to when kids come along and you eventually need a bigger place? Many families will undertake a massive (possibly unsustainable) debt burden that will negatively influence their entire life. The last point is the one I worry about. What does a society look like where families are toiling under the pressure of their massive mortgages? Unable to take holidays, struggling to put food on the table, unable to even think about supporting their community (either financially or in time)? That’s why, I would encourage my peers and those just starting out their adult life to seriously think whether the traditional aspiration of house ownership is still relevant. For a long time now I have been frustrated by the financial situation of wanting to have savings accounts so that I can keep my savings separate from my mortgage (e.g. saving for a holiday or a new gadget) but knowing that it’s a stupid thing to do financially since the interest rates are lower and you have to pay tax on the interest. So…one day I was lying on the couch reading the Steve Jobs biography and I had a eureka moment. “Why not design a website which replicates the savings accounts I have in the bank ‘virtually'”. The idea is that the “real” money goes into my mortgage but an equal amount is put in a Virtual Savings account. A few months of development later… Kaha.biz is born. I’m super excited about the opportunity to share this site with the world, while also a bit nervous about whether people will understand it, enjoy it or just find a million bugs! There seems to seems to be a fault with the windows phone platform affecting a wide group of it’s users wherein in the last couple of days (most users report on 31st July) their calendars are not syncing between windows live and WP7. If you’re being impacted, hit that page an press the “me too” button on the top right. That thread also highlights some suspicious product launches that may have caused the issue, but it’s all speculation at the moment. Apparently the only fix at the moment is to hard reset. When I better solution is found, I’ll post it here.